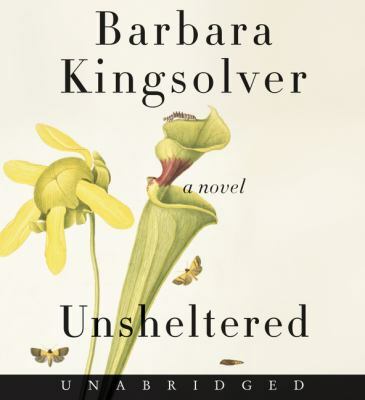 Guest blog by Laura V.
I enjoyed the technique of intermingling two storylines in Unsheltered by Barbara Kingsolver but since I listened to the audio version, sometimes it took me several seconds to mentally shift gears into the other story when a new chapter started. One story takes place during the campaign leading up to the 2016 United States Presidental election where a controversial unnamed male candidate is simply referred to as The Bullhorn. After chasing the proverbial brass ring their whole careers, Willa Knox and her husband Iano Tavoularis have both lost their jobs due to closures. They move to Vineland and try to balance life with her super right-wing father-in-law, millennial daughter who Willa doesn’t understand, and her unemployed, Ivy League son’s new baby. All the while, their inherited home is becoming less stable on its crumbling foundation. The other story takes place in the same location post-civil war. Thatcher Greenwood has a new position in a recently-founded utopian community, Vineland. He brings his new bride and her family back to their old home from before they lost their patriarch and his fortune. He struggles to keep up with his new family’s penchant for the good life, while they refuse to believe their patriarch built a house that was already in dire need of major renovation. Greenwood finds a friend and kindred spirit in his neighbor, Mary Treat. Treat was a fascinating real historical figure who was a frequently published self-taught botanist and a correspondent of Charles Darwin. In some ways this book is a mirror for our current state of the union. I know many readers besides myself with be able to identify with the confusion and frustration brought on by having done “all the right things” only to be left with a severance package and a new job search at an age where starting over seems exhausting. My favorite characters were Mary Treat and Tig, Willa’s daughter. Mary was able to slyly outmaneuver the barriers against women in science and actually made a living out of it in the late 1800s! Tig seemed to have her feet more firmly planted in the reality that is the state of the world today, while Willa clung to the world as it used to be or should be. Kingsolver writes beautifully, as usual. Her characters are interesting and have depth. Although I think she oversimplifies some topics occasionally and she made too much use of coincidence in this novel. If you haven’t read Kingsolver, this would be a decent introduction and if you’re a fan, you’re sure to enjoy it.